Ruth Ducker was furious. Days before last Christmas she walked out to find her Volkswagen Polo missing from its normal space. Instead, she found two brand-new yellow "no parking" lines where her car had been. The London-area resident knew her car could not have been stolen, she had the battery in-hand, so the only possible explanation was the car had been towed away. 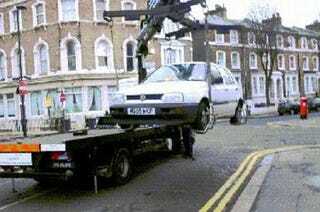 So she contacted her local council and after two weeks of badgering they finally admitted they had her car, but to get it back there would be an £800 fine. No way, thought Ruth. After getting her Member of Parliament involved, the town council eventually admitted the car had been legally parked when contractors lifted the car to paint a set of double yellow lines underneath it (double yellow on the curbside indicating a no parking zone). Furthermore, they set the car back down and parking enforcement spotted it, took the above pictures, and had the vehicle towed later in the day. The council had never informed the locals of the work, and somehow didn't see a problem with any of this. Eventually the MP managed to make things right, getting the council to waive the fine of £2400, which had ballooned during the confrontation, and return the car.